Time isn't a straight arrow, nor is it a flat circle (sorry, McConaughey) — rather, the "chronosphere" is just that: a sphere we're all trapped in. But what if the sphere could be traversed, manipulated, emerged from? If the past is memories, the future is dreams, and the presents slowly recedes into the past only due to the passage of time, what if all it took to navigate within the chronosphere is the human mind, well trained? 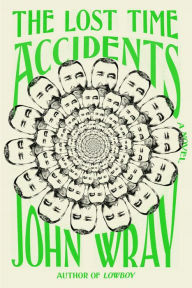 If this sounds like the stuff you and your buddies talked about at 3 am after getting high in your dorm room, that's nearly the exact effect of reading The Lost Time Accidents, John Wray's new crazy, smashingly smart novel. But this is also a really funny novel — stopping just short of zany, but often with one-liners and scenes worthy of more than just a snort. There are three stories at once. A guy named Waldy Tolliver is writing his family's history. He's been "excused from time," meaning he's stuck at 8:47 EST in presumably near-present day. He doesn't know why or how, and neither do we. We just accept it. The second story is the history Waldy is writing, and this is the meat of the novel — his great-grandfather, Ottokar Toula, living in a small town in Moravia at the turn of the 20th century discovers the secret to the universe — the Lost Time Accidents — but before he can tell anyone, he's hit by a car and dies. His two sons, one evil (Waldemar, for whom our stuck-in-time-biographer) is named, one good, Kaspar, both spend their lives in dramatically different ways trying to discover what their father had figured out. The story moves through the generations of the family, to Kaspar's son, Orson. Orson has a different relationship with family legacy, deciding to forgo physics to instead to write low-grade sci-fi. The ideas in one of his novels accidentally launches a Scientology-like cult called the United Church of Synchronology. Finally, the third story is our narrator/biographer telling us the story about how he met a beautiful woman named Hildegard Haven at a party before he got stuck in time. He then proceeds to carry on a scandalous (Mrs. Haven is married after all), wild romance with her, leading up to his becoming stuck in time. Naturally, all the stories converge (to a singularity?) and I was riveted in the second half of this novel to see how it'd all work out, to see if the various characters would truly solve the mystery of the Lost Time Accidents (if there actually is a definitive solution). From how to deal with the "grandmother paradox" (if you travel back in time and kill your grandmother, don't you cease to exist? But then how could you have traveled back in time to kill your grandmother? You don't exist!) to the "Patent Clerk" (Einstein, but the family hates him, because he just barely beat them to discovering relativity) and dozens of other head-trippy ideas in between, this is a novel that is a refreshing, inventive new take on the tried-and-true time-travel novel. If you're a fan of David Mitchell's head-warping stories, you likely won't be disappointed here. Despite the length, and some sagging of interest in the first half, this is a terrific novel if you're in to stories that are more than just a bit out there. When Breath Becomes Air: Where Shall Meaning Be Found? We all know we're going to die, it's just a matter of when. So when that "when" becomes more sure or sooner than we'd thought — when it's not some nebulous future time we'd rather not think about — why then is it harder to find meaning for life? After all, nothing has changed — death is still inevitable. 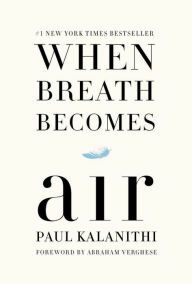 But that question of finding meaning in the face of sure death is the central question of When Breath Becomes Air, the devastating, but must-read book by Paul Kalanithi, and his wife, Lucy. You know the story, Paul, a brilliant neurosurgeon is diagnosed at age 36 with terminal lung cancer. And this book is struggle to come to terms, to put his life in order, to leave a legacy (this book, but also a daughter), and to try to puzzle out what it all means. It's as much an intellectual memoir as it is one about his life, his education, his residency, and his struggle to be a good doctor. Kalanithi is a fascinating man — curious and engaged with the world, a deep reader (he has a Master's in literature! ), and with a profound respect for people. One of the best sections of the book is Kalanithi's argument, even a scientist and intellectual, not to dismiss the metaphysical — whatever that means to you, God, love, other "things" not possible to be proven by science. I know many readers will shy away from this because it's difficult. It certainly is difficult — simply put, it's 220 of the saddest pages I've ever read (especially the 20 pages of epilogue written by his wife Lucy after he's died). But I'd encourage you to read it despite that. It's a perspective-changing, life-affirming book (ironic, I know, for a memoir about death). I'd also encourage you to read what novelist Ron Currie, Jr., wrote about the book on Facebook. It's a perfect encapsulation of why it's important to read this book, as well. 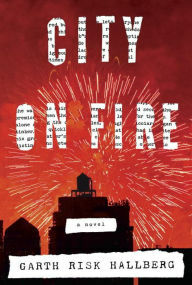 City on Fire, Garth Risk Hallberg's much ballyhooed debut novel, is simultaneously way, way too long (it clocks in at 900+ pages) and not nearly long enough. Here's how that's possible: It felt too long because there were times, especially in the first few hundred pages, when I struggled to convince myself to pick up it again. But then as the novel gains momentum at about the halfway point, it's as riveting as any thriller. And what's more: Hallberg is an absolutely enthralling writer. Even when I was bored by the seemingly superfluous background info on one or any of the multitude of characters, I still appreciated how smooth and elegant he is to read. And that's why, in addition to the fact that this is a story that could've continued for several (dozen?) more years exploring the lives of these characters (most of whom I now really miss), I could've read several hundred more pages of this prose. It's a truly great novel, a rather awe-inspiring accomplishment for a debut. Here's the deal: It's New Year's Eve, 1976, and we swing all around New York City to be introduced to a variety of characters, punks and detectives, Blue Bloods and anarchists, devious businessmen, teachers, journalists, and artists. The novel itself is plotted around a shooting in Central Park on this fateful New Year's night. So the novel is ostensibly a murder mystery, but of course, so much more. Hurdling to a conclusion the following summer, the night of July 13, 1977, the famed New York City Blackout, the novel forges a series of connections, both coincidental and not, between this cast of highly fascinating people. The enduring image in my head as I spent nearly a month with this book was of the writer as a builder — each little chapter (and there are 94 total) fills in a gap of the story, like a brick in a wall, slowly building the complete mural or portrait on that wall. Hallberg also gives us "interludes" between each of the seven sections of the novel. These are awesome. From a punk's fanzine to a journalist's Truman Capote-esque investigative article, these set pieces add to the fullness of the portrait and are a joy to take in. That's not always the case for strategies like this — often they feel like distractions. But slowly we learn about how all these characters are connected, and how solving a crime, in many ways, is like real life in that it's a "grid of connections" that brings the meaning to the mystery. The fluidity of time is also a hallmark for Hallberg, and certainly one of the reasons he chose the structure he did — constantly moving back and forth from real-time action to background info. Also, there are lots of birds — symbols for many things, which you can puzzle out for yourself if you decide to take on this challenge. In sum: Yes, this is a novel that's worth the time. But if you start it, commit yourself to finishing it! The majority of the lukewarm reviews on this novel are readers who didn't finish it. This, to me, is a travesty. You don't get the full portrait otherwise — it's like judging the Mona Lisa by only seeing a sliver (to borrow a sentiment from this fantastic Atlantic piece). It's a battle that may wear you down at times, but a rewarding one in the end.